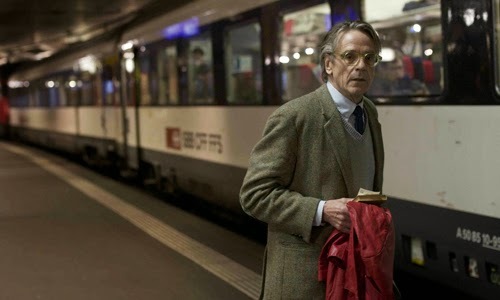 On the way to teach a language class, Swiss professor and introverted bookworm Raimund Gregorius (Jeremy Irons) happens upon a woman in a eye-catching red coat standing along the railing of a bridge, readying herself to jump. After being rescued by Raimund and enigmatically disappearing, she mistakenly leaves her coat with the teacher, where he discovers a book in one of the pockets while searching for identification. Inside, along with a train ticket departing soon, lies an address that points to Lisbon, the capital of Portugal. Thus begins Raimund's adventure in the lethargic and motorized Night Train to Lisbon, Bille August's adaptation of Pascal Mercier's novel of the same name, where his propulsion to learn more about the woman and her fascinating book opens the door to discovering more about the author, Amadeu do Prado (Jack Huston), and his participation with the Portuguese resistance in the '70s. From the moment Raimund flips open the book and spots his first clue, there's a mechanical ease to the chain of events in Night Train to Lisbon's modern timeline, where plot devices -- tickets, broken glasses, packages of cigarettes -- conveniently guide the teacher on his journey. Director August's makes the modern-day era feel stale and archaic as a result, like a dime-novel detective story without the immediacy of a real mystery to solve, especially once Raimund completely shifts his attention from the woman in the red coat to Amadeu's life as a doctor and writer. It's intended to be a time of reawakening and day-seizing for the professor, a break from his sleepless nights of playing chess and exploring literature, yet it's difficult to discern why this gets his heart racing, why the girl he saved and the mystery author are worth abandoning his responsibilities, instead of, say, dabbling in his research between classes. Those questions and philosophical ponderings stirring in Raimund's mind after reading the novel bear the weight of the issues in Night Train to Lisbon, where the ideas communicated by Amadeu do Prado's book only intermittently surface for us to understand how they propel the newly-enraptured scholar. It's peculiar to see how much of Jeremy Irons' inherent, bristly charisma gets trapped under the professor's subdued persona as he ricochets between individuals from Amadeu's past -- his relatives and acquaintances in the Portuguese resistance -- building to largely mundane conversations designed for a deliberate slow-release of information that feeds into Raimund's muted soul-searching. A sole exception comes in his happenstance relationship with an optometrist, Mariana (Martina Gedeck), who coaxes those inner sensations to the surface, bringing literal and figurative clarity to Raimund as they turn philosophy into flirtation. The other side of Night Train to Lisbon comes the historical accounts revealed by those involved in Amadeu's life, judiciously fragmented and revisited across the film as more information comes to light. While this structure serves a purpose by effortlessly filling in gaps as Raimund discovers more through alternate perspectives, it thoroughly depletes the film of urgency, making Amadeu's draw towards the Resistance less profound than it should be. Even intense moments, from body trauma to mob-mentality threats, lose their edge in this low-key jigsaw puzzle of sepia-colored recounts. The shuffle of memories, finally revealing a woman, Estefania (Melanie Laurent), who complicates his involvement, fit together into a nondescript and lethargic portrait of political inspiration and idealistic breakthroughs, working against Boardwalk Empire's Jack Huston and Inglourious Basterds' August Diehl as they cunningly simmer in their roles as enlightened friends who becomes comrades for the cause. Through unpretentiously beautiful cinematography capturing Portugal's atmosphere, Night Train to Lisbon constructs this story within a story that fascinates Raimund yet isn't very fascinating to watch unfold, despite its historical context and eventual shift towards the melancholy of impossible relationships. Quietly potent performances from Charlotte Rampling (Swimming Pool) and Bruno Ganz (Wings of Desire) enhance the transitions between past and present without truly enlivening the scenarios built around them, while Melanie Laurent's delicate, magnetic presence almost goes to waste amidst a wholly superfluous love triangle. That leaves only the discoveries Raimund has at the end of his journey -- about the girl in the red coat and the outcome of Amadeu's affection, immaculately played by Lena Olin (The Unbearable Lightness of Being) as the aged iteration of Estefania -- to underscore some sort of catharsis and inspiration for his midlife trip away from the confines of his classrooms. It's a drawn-out and snoozy ride to get him there, but at least this fixated professor gets the chance to rebel against his comfort zone in his own way.